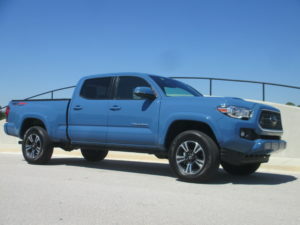 CLICK HERE TO WATCH TESTDRIVENOW AUTO CRITIC STEVE HAMME’S COMPLETE REVIEW OF THE 2019 TOYOTA TACOMA. In 2019, Tacoma adds two additional USB charging ports in the center console, and the SR grade trucks now include standard privacy glass. Extensive use of high-strength steel in the frame and hot-stamped, ultra-high strength steel in the body gives the Tacoma a strong foundation for hard work, hard play, and durability. All Tacoma models are equipped with double wishbone coil-spring front suspension and leaf spring rear suspension with staggered outboard-mounted gas shocks. This setup delivers a steady on-road ride yet also bolsters the truck’s off-road driving capability. There’s strength under the hood, too. The 2.7-liter DOHC four-cylinder with VVT-i produces 159 horsepower and 180 lb-ft of peak torque. 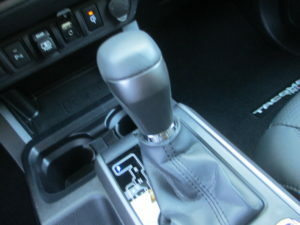 Those wanting more power can opt for the Atkinson-cycle 3.5-liter V6 featuring Toyota’s innovative VVT-iW technology. 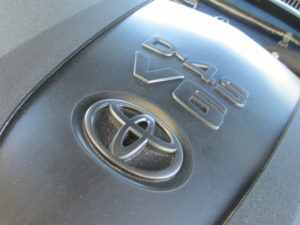 The engine also utilizes Toyota’s D-4S injection system, which incorporates both direct injection and port fuel injection. This efficient engine cranks out 278 horsepower and 265 lb-ft of peak torque. Each of the engines can be teamed to a six-speed Electronically Controlled Automatic Transmission with intelligence (ECT-i), or the V6 can also be paired with a 6-speed manual transmission. 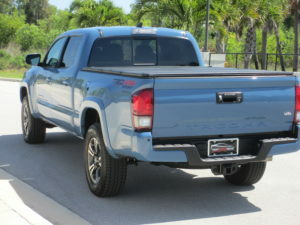 When equipped with an optional V6 Tow Package, depending upon the grade, the Tacoma can pull up to 6,800 lbs. (per the SAE J2807 tow standard). 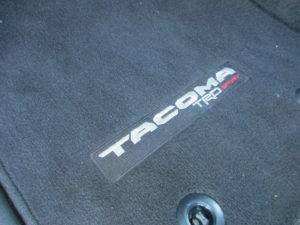 CALTY designers in Newport Beach, California, and Ann Arbor, Michigan, helped give the new-generation Tacoma an unmistakably athletic and stylish identity that retains everyday functionality and ruggedness. They took some inspiration from Toyota’s legendary desert race trucks. The overfenders look tough and also serve to accommodate the suspension’s generous wheel travel. The Tacoma’s high-lift image reflects its go-anywhere capability. Seven available wheel designs range in diameter from 16 to 18 inches. 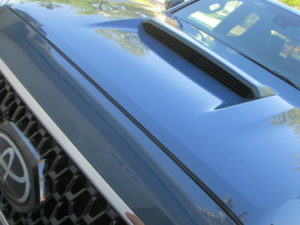 Tacoma’s chiseled face is anchored by a bold, hexagonal grille and a tall, muscular hood. Its slim, projection beam headlights can be outfitted with available LED daytime running lights. 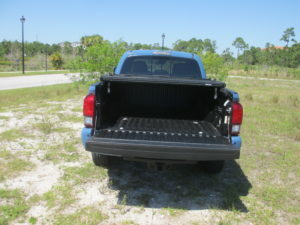 The tailgate has an easy-lowering feature, which allows it to retract slowly to prevent it from slamming down. 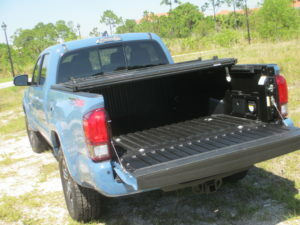 An available factory-installed tri-fold hard tonneau cover secures gear out of sight. 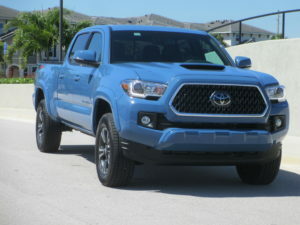 The Tacoma’s exterior color palette includes Cavalry Blue, Midnight Black Metallic, Barcelona Red, Quicksand, Magnetic Gray Metallic, Silver Metallic, Super White, Cement and Voodoo Blue (TRD Pro only). 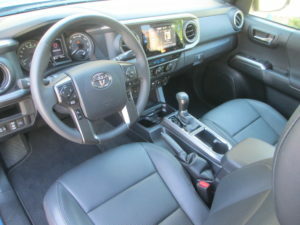 Tacoma may be tough, but its interior treats the driver and passengers gently. Soft-wrapped trim and metallic accents set the stage for a high-quality look and feel. Comfort and durability come together in Tacoma’s seating, which varies by model grade. 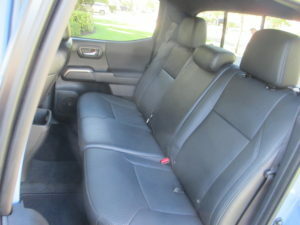 All Tacoma models feature a driver’s seat with adjustable lumbar support and four-way adjustable front passenger seats. 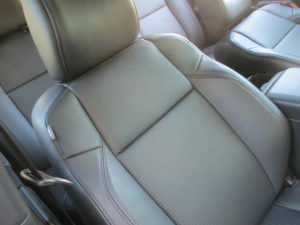 The SR and SR5 grades are equipped with fabric-trimmed seats. Seating for the TRD Sport and Off-Road grades is uniquely upholstered with embossed fabric that conveys a dynamic and rugged feel. 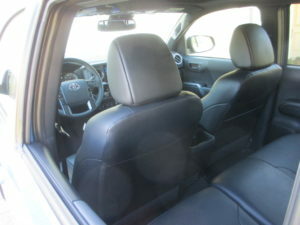 The TRD Pro comes with leather-trimmed seating plus heated front seats, and the premium Limited grade offers seats trimmed in rich leather. 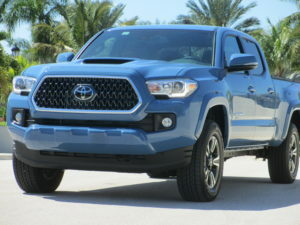 The 2019 Tacoma is available in 32 models based on two cab types, the extended Access Cab and four-door Double Cab, each available in 4×2 or 4×4 configurations. Access Cab models offer under-seat rear storage space, and their fold-up seat cushions maximize carrying space. 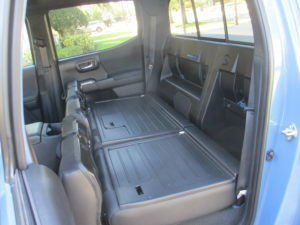 Double Cab models feature 60/40 split rear seats with adjustable headrests and under-seat storage. The deck rail system can carry just about whatever you need to. 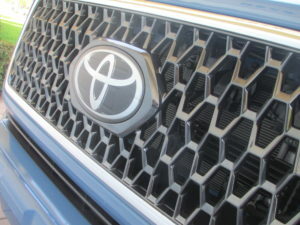 It’s compatible with Genuine Toyota Accessories, including a cargo divider that locks into the rails to help keep cargo from sliding around the bed, and mini tie-downs with hooks that also help to secure cargo. An available 120V/400W power point further extends the bed’s utility. All Tacoma 4×4 models are equipped with 4WDemand part-time 4WD with an electronically controlled transfer case and either an Automatic Limited Slip Differential (Auto LSD) or an electronically controlled locking rear differential. Auto LSD is an electronic, brake-actuated system that functions like a mechanical limited slip differential when activated at low speeds, while TRD Off Road models feature a selectable, electronically controlled locking rear differential to provide supreme traction in off-road environments. Tacoma TRD Sport models are equipped with sport-tuned shocks. TRD Off-Road models include an off-road tuned suspension that includes Bilstein shocks. Inspired by Toyota’s long history of off-road racing success and knowhow, the Tacoma TRD Pro is aimed squarely at diehard off-road enthusiasts. For 2019, it gets even better with the addition of the available eye-catching, TRD-designed Desert Air Intake. 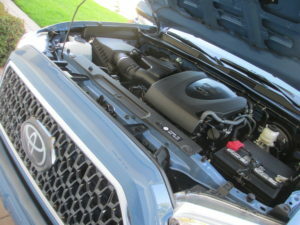 Designed to help raise the engine’s air intake out of the dust and into clean air, the available Desert Air Intake helps the Tacoma to perform at its best even when conditions are not. 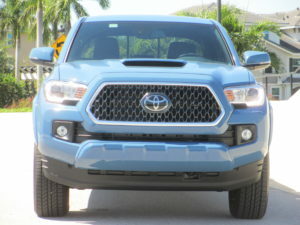 Tacoma TRD Pro is distinguishable thanks to its heritage-inspired “TOYOTA” front grille with color-keyed surround, blacked-out hood scoop and graphic, color-keyed power outside mirrors with turn signal indicators, color-keyed door handles, black overfenders, and color-keyed rear bumper. 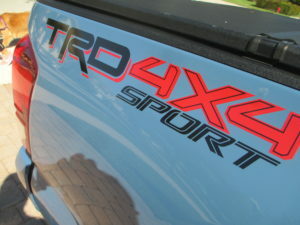 Available TRD Pro exterior colors include Midnight Black Metallic, Super White, and the exclusive Voodoo Blue inspired by another iconic off-roader, the FJ Cruiser. The TRD Pro is more than a tough-looking truck. It’s designed to perform in the toughest of off-road environments. 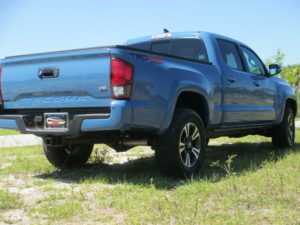 Based on the Tacoma TRD Off-Road 4×4 Double Cab short-bed model with either a six-speed manual transmission (with clutch start-cancel switch) or six-speed automatic, the Tacoma TRD Pro comes ready to conquer hill and trail. 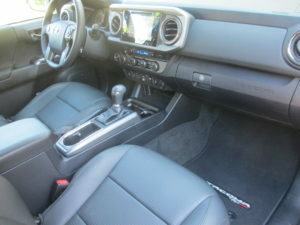 Inside, the Tacoma TRD Pro blends toughness with comfort, incorporating black leather-trimmed heated front seats with TRD Pro logos on the headrests, TRD shift knob, and TRD Pro floor mats. 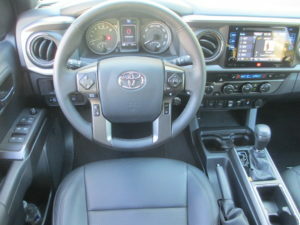 The TRD Pro instrument panel integrates a 4.2-inch color Multi-Information Display with an inclinometer and tilt gauge, plus displays for outside temperature, odometer, tripmeters, and average fuel economy. 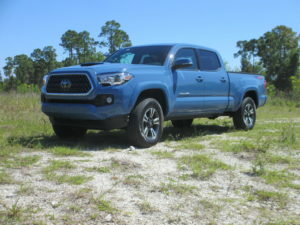 For 2019, Tacoma TRD Pro also includes JBL Premium Audio (automatic transmission only) and a moonroof as standard equipment. 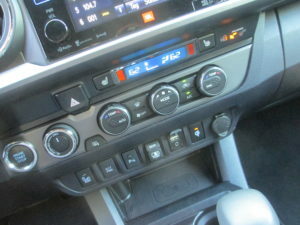 The Tacoma SR grade comes standard with the base Entune Audio system featuring the Entune Multimedia Bundle, which includes a 6.1-inch touchscreen display with AM/FM CD player, 6 speakers, auxiliary port, USB media port, advanced voice recognition, hands-free phone capability, phone book access and music streaming via Bluetooth wireless technology, and Siri Eyes Free and an integrated backup camera display. Tacoma SR5 models get Entune Audio Plus, which includes a 6.1-inch high-resolution touchscreen display, AM/FM/HD Radio, CD player, 6 speakers, auxiliary port, USB media port, advanced voice recognition, hands-free phone capability, phone book access and music streaming via Bluetooth wireless technology, Scout GPS Link Compatible, Siri Eyes Free, SiriusXM Satellite Radio with 3-month all-access trial. Entune Premium Audio with Integrated Navigation and Entune App Suite is standard on TRD Sport and TRD Off Road. This system adds the Entune Multimedia Bundle with a 7-inch high-resolution touchscreen featuring split display, Entune App Suite, HD Radio predictive traffic and Doppler weather overlay. 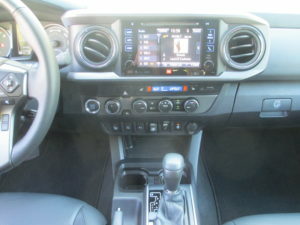 At the top of the line, the Tacoma TRD Pro (w/automatic transmission) and Limited grades come standard with the Entune Premium JBL Audio system, which includes a 7-inch high-resolution touch-screen with split-screen display, AM/FM cache radio, HD Radio, CD player, six JBL speakers and subwoofer amplifier, auxiliary port, USB media port, advanced voice recognition, hands-free phone capability, phone book access and music streaming via Bluetooth wireless technology, Siri Eyes Free, HD Radio Predictive Traffic and Doppler Weather overlay, and SiriusXM Satellite Radio with 3-month All Access trial. 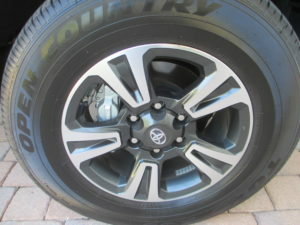 See toyota.com/entune for details. Toyota offers a wide variety of optional packages to personalize the 2019 Tacoma, and the newest offering is the SX Package that offers a cool black-out theme that doesn’t come with a hefty price tag. Based on the SR grade and available on 4x2s and 4x4s, SX adds a host of black-keyed accents that include the overfenders, mirror caps, door handles, headlamps and 4×4 badge. It also includes a black grille and 16-inch black matte black alloy wheels. The package is available on six colors that include Super White, Silver Metallic, Magnetic Gray Metallic, Barcelona Red Metallic and Quicksand. In addition to the new SX, Tacoma offers a plethora of package options: the Utility Package (SR only), SR Convenience Package, SR5 Appearance Package, Parking Sonar & Navigation Package and three levels of Premium & Technology Packages. 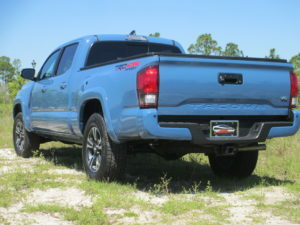 Along with standard TSS-P, Tacoma also touts the Star Safety System as standard equipment, which includes Vehicle Stability Control (VSC), Traction Control (TRAC), an Anti-lock Braking System (ABS), Electronic Brake-force Distribution (EBD), Brake Assist (BA), and Smart Stop brake override technology (SST). 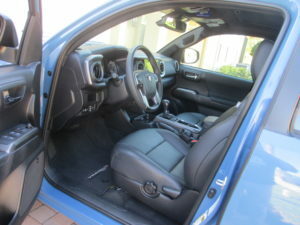 Every Tacoma has the driver and front passenger Advanced Airbag System, driver and front passenger knee airbags, and front and rear Roll-sensing Side Curtain Airbags. Standard active head restraints for the front seats are designed to move up and slightly forward during a rear-end collision to help reduce the risk of whiplash. Additional standard safety features include a Tire Pressure Monitor System (with individual tire location alert on most grades). The Toyota engineering team at Toyota Technical Center in Ann Arbor, Mich., takes great pride in its role helping to develop the latest generation Tacoma pickup. 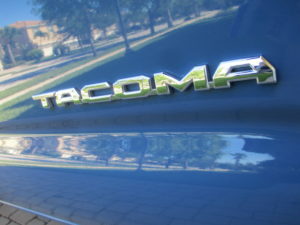 The Tacoma is assembled at Toyota Motor Manufacturing, Texas (TMMTX), in San Antonio and Toyota Motor Manufacturing, Baja California (TMMBC), in Baja California, Mexico. 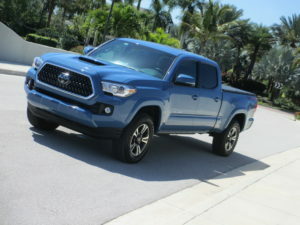 The Tacoma also comes standard with ToyotaCare, a complimentary plan covering normal factory-scheduled maintenance and 24-hour roadside assistance for two years or 25,000 miles, whichever comes first.